and options for drinks and dining in Elements or Jade Bar. and all the attractions of greater Phoenix. One of the most coveted retreats in Phoenix’s Valley of the Sun, Sanctuary on Camelback Mountain clings to the rugged northern slope of its namesake mountain. Intimate and sophisticated, favored by Hollywood heavyweights and readers of Condé Nast Traveler, the resort welcomes groups seeking an inspirational environment well above the day-to-day fray. Stone walkways lead to the newly renovated Sanctuary Spa, an intimate, Asian-inspired escape; Elements restaurant and dining deck, Praying Monk for special events, XII for private dining, and Jade Bar, all led by Food Network star and executive chef Beau MacMillan; and 109 luxury casitas. Seven private mountainside villas — complete with pools and terraces — provide exceptional lodgings for VIP groups. Like everything at the resort, the remodeled accommodations offer Zen-like simplicity, natural materials, and spectacular views of the surrounding mountains. Custom corporate activities range from wellness programs and cooking classes to photography workshops and tennis tournaments. The Spa House enclave — with its movement studio, spa room, lower lawn for events, and four additional Terrace Casitas — creates an ideal venue for corporate retreats. The Views Ballroom, set in a secluded building, offers its own foyer and reception area, floor-to-ceiling windows, and a wraparound terrace. It serves up to 200 participants for conferences and banquets or divides into five spaces for smaller affairs. Two boardrooms stand by for executive sessions, while the infinity pool deck, patios, terraces, lawns, and private homes set the stage for unforgettable parties under the Arizona sun and stars. Great for a smaller incentive group. Staff was eager to please, guest loved the natural scenery. Elements is a MUST for meal time. Love, love, love Sanctuary!!! You simply can not go wrong. State of the art rooms, food, bar, everything!!! You'll never regret a stay on this property. The location is perfect for leisure or business travel, as there is much to do in the area, but it's also the perfect place just to stay and hang at the resort. The staff is top-notch and will bend over backwards to ensure everyone has the best experience possible. Everything from the rooms to the food to the spa services are amazing. Special mention goes to the sales staff and the catering department who always make sure we are happy. Although we have entertained the idea of checking out other places in the area, we always go back to Sanctuary because they make us feel welcome each and every time...and our group loves it! The property, on every level—from the service to the look and feel—speaks a lot about what Jaguar stands for and the level of luxury we look for. Fantastic experience. Our guests were blown away by the property. Conference services took excellent care of us and dinner at Elements was spectacular. After holding our Top Producer Conference at Sanctuary on Camelback Mountain, it was easy to see why it was included on Condé Nast Traveler's Readers' Choice list of top resorts in the U.S. Hands down, this was the best incentive program in the history of Next Financial Group. SCOTTSDALE, Ariz. (Feb. 4, 2014) – Weekend blues be gone! Sanctuary on Camelback Mountain is once again turning Sunday into the best day of the week with the return of its award-winning music series, Sundays in Paradise. From Feb. 9 through March 30, local music lovers can enjoy cocktails, wine and small plates while listening to entertainment from top regional and national performers. This year, the series will move to the patio of the newly re-designed jade bar, with two marquee events held on the Paradise Views lawn. Sundays in Paradise is from 2-6 p.m.* and admission is $5 per person ($15 for marquee engagements on March 9 and March 23). Drinks and food are a la carte, and a Gourmet Picnic Package is available for $65 including admission for two, preferred seating, a bottle of wine, choice of appetizer, and a blanket for the afternoon. For more information and reservations, please visit www.sanctuaryaz.com or call (480) 607-2300. Groups of four or more are asked to call in advance to reserve a spot. About Sanctuary on Camelback Mountain: One of the country’s most lauded luxury resorts, Sanctuary is a striking boutique property on Camelback Mountain in Paradise Valley, Arizona, just minutes from downtown Scottsdale. Under the direction of Westroc Hospitality, Sanctuary enjoys international acclaim for its contemporary design, and award-winning elements restaurant and Sanctuary Spa. A member of Small Luxury Hotels of the World, Sanctuary was named the number one resort in Arizona in Travel + Leisure’s “500 Best Hotels in the World” and the number one resort in the Southwest in Condé Nast Traveler’s “Readers’ Choice Awards”. Sanctuary has been a Condé Nast Traveler “Gold List” and “Reader’s Choice” winner since opening in 2001. Connect with Sanctuary on Facebook, Twitter, Instagram and Pinterest. SCOTTSDALE, AZ, Oct. 2012 – The results of Condé Nast Traveler’s 25th annual Readers’ Choice Awards are in, and Sanctuary on Camelback Mountain has been voted the number one resort in the Southwest. With an overall score of 92.5 reflecting readers’ opinions on rooms, service, food, location, design and activities, Sanctuary shares the region’s top spot with Tucson’s The Ritz-Carlton, Dove Mountain. This year, Condé Nast Traveler received a record 46,476 responses, with readers evaluating more than 10,000 resorts, destinations, airlines, and cruise lines worldwide. 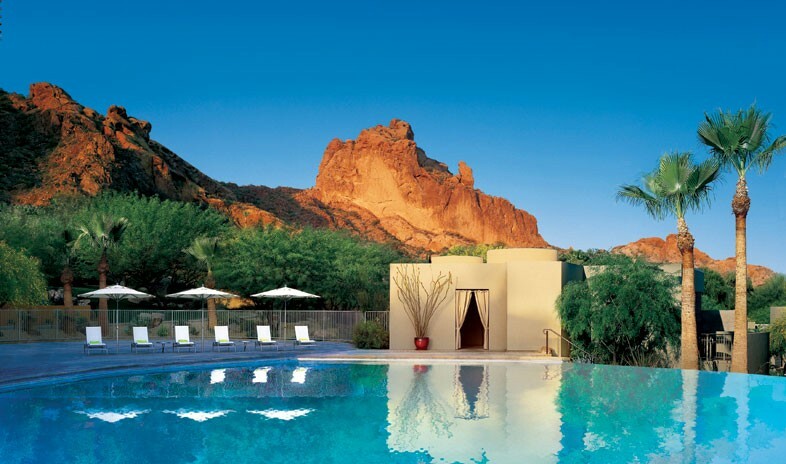 About Sanctuary on Camelback Mountain: One of the country’s most lauded luxury resorts, Sanctuary is a striking boutique property on Camelback Mountain in Paradise Valley, Arizona, just minutes from downtown Scottsdale. Under the direction of Westroc Hospitality, Sanctuary enjoys international acclaim for its contemporary design, and award-winning elements restaurant and Sanctuary Spa. A member of Small Luxury Hotels of the World, Sanctuary was recognized in 2006 as the “top resort” in the United States by the readers of Condé Nast Traveler. Sanctuary has been a Condé Nast Traveler “Gold List” and “Reader’s Choice” winner since opening in 2001, and in 2012 was named #1 Resort in Arizona in Travel + Leisure’s 500 Best Hotels in the World. Connect with Sanctuary on Facebook, Twitter and Pinterest. Scottsdale, Ariz. (Jan. 12, 2010) - Sanctuary on Camelback Mountain in Scottsdale, Ariz. is high on recent developments (in part, thanks to a new sugar buzz). Pastry Chef Renee Cade has joined its culinary team, leading the charge on a sweet new focus for the resort's award-winning restaurant, elements. Thanks to a sparkling new pastry kitchen - part of a recent multi-million dollar renovation - Chef Cade will have the tools to craft delectable pastries and over-the-top endings to complement Executive Chef Beau MacMillan's new menu, unveiling Jan. 14, 2010. A graduate of Le Cordon Bleu College of Culinary Arts in Scottsdale with a Patisserie and Baking Certificate, Chef Cade honed her skills with The Ritz-Carlton, Phoenix and The Phoenician in Scottsdale prior to joining Sanctuary. She also brings a unique breadth of knowledge to her new post, with a Bachelor of Arts in Intercultural Communication: Japan and the U.S. and a Master of Arts in Japanese Language from the University of Hawaii at Manoa in Honolulu. Chef Cade's new pastry program is the cherry on top of an extensive kitchen renovation that Sanctuary began Summer 2009. In addition to a pastry kitchen, elements acquired a smoker, intense-heat char-broiler, plancha grill and other enviable kitchen gadgets, giving Chef MacMillan double the space to produce his vision for the restaurant. Starting Jan. 14, patrons will find a new "raw" menu featuring sake poached shrimp and other sustainable delicacies from the sea, as well as a host of locally-sourced and organic ingredients on the expanded menu. Chef MacMillan (well-known as a winner of the Food Network's Iron Chef competition and currently appearing in its new series, Worst Cooks in America) is using his new, world-class space to elevate Sanctuary's dining experience. For more information or to make a reservation at Sanctuary on Camelback Mountain, visit [url]www.SanctuaryAZ.com[/url] or call 1-800-245-2051. About Sanctuary on Camelback Mountain: One of the country's most lauded luxury resorts, Sanctuary is a striking boutique property on Camelback Mountain in Paradise Valley, Arizona, just minutes from downtown Scottsdale. Under the direction of Westroc Hospitality, Sanctuary enjoys international acclaim for its contemporary design, and award-winning elements restaurant and Sanctuary Spa. A member of Small Luxury Hotels of the World, Sanctuary was recognized in 2006 as the "top resort" in the United States by the readers of Cond Nast Traveler and was included on the Travel & Leisure "T + L 500" list. Sanctuary has been a Cond Nast Traveler "Gold List" and "Reader's Choice" winner since opening in 2001. Scottsdale, Ariz. (November 4, 2009) - Sanctuary on Camelback Mountain's own Beau MacMillan, executive chef of elements restaurant, will be schooling 12 of the nation's most disastrous kitchen rookies in Food Network's latest elimination challenge, designed to turn novice cooks into great chefs. Along with Secrets of a Restaurant Chef host Anne Burrell, Chef MacMillan will lead a culinary boot camp for the "Worst Cooks in America," in a five-week series premiering January 3 at 10 p.m. ET/PT. Chef MacMillan will put his own considerable culinary reputation on the line as he divulges the tricks of the trade to a team of recruits who will face off against a second team led by Chef Burrell. The two competitors - one from each team - who are left standing at the end of four elimination rounds will then prepare a three-course meal for a panel of food critics who have been led to believe they are tasting the work of Chefs MacMillan and Burrell. Whether or not Chef MacMillan's apprentice takes the $25,000 grand prize will be revealed in the finale to air February 1 at 9 p.m. ET/PT. Back at elements, Sanctuary's signature restaurant, Chef MacMillan is overseeing the final details of a state-of-the-art kitchen renovation and expansion. The transformation will also introduce an exclusive private dining venue, to be called XII, and an 800-bottle wine corridor and tasting station. Chef MacMillan is no stranger to Food Network fans, having competed on Iron Chef America. He has also demonstrated his culinary wizardry at The James Beard House. In addition to serving as executive chef of elements, which he helped open in 2001, Chef MacMillan has worked in the kitchens of Los Angeles' Hotel Bel Air and Shutters on the Beach in Santa Monica, as well as La Vielle Maison in Boca Raton, Florida. He is a graduate of Johnson and Wales University in Providence, Rhode Island. Scottsdale, AZ. (Sept. 2, 2009) - As hotels and resorts worldwide look to curb costs and tighten spending, Sanctuary on Camelback Mountain has seized the moment to blossom. The preeminent boutique resort has initiated a multi-million dollar renovation that will yield an exciting new dining experience this Fall. "These are challenging times, but we choose to respond to them opportunistically," said general manager and vice president, Mike Surguine. "We are investing in Sanctuary's future, and in our quest to compete with the finest resorts in the country and keep improving our guest experience." The resort continues to welcome guests to its world-class facilities, but behind the scenes, a full-scale transformation to elements' kitchen is underway, doubling its size and providing Executive Chef Beau MacMillan (well-known as a winner of the Food Network's Iron Chef competition and three-time guest on NBC-TV's Today Show) with a world-class space to elevate Sanctuary's dining experience. Once finished, he will continue to serve the award-winning, farm-fresh American fare with Asian accents that has made elements a local and national favorite. But the new space will also provide the opportunity to expand elements' menu and introduce diners to new concepts and flavors. Also out of view of guests is the development of an extraordinary private dining room, known as XII. Guests will pass through a new wine corridor exhibiting 800 bottles and featuring a sommelier station to reach it. An intimate setting for up to 12, the room will be a master stroke, and not just in terms of the cuisine. Only those who experience it will understand the significance of the aforementioned statement. Come Fall, Sanctuary's former Sunset Patio will also be reincarnated. Inspired by a unique rock formation on neighboring Camelback Mountain known as the "Praying Monk," Sanctuary will introduce Praying Monk. Enclosed by sliding window walls and a retractable skylight roof, the renovation will turn the coveted outdoor setting into a year-round option from which to enjoy views of the patio's namesake as well as Paradise Valley. During this period of transition, resort guests and local residents can continue to expect the same outstanding service for which Sanctuary in known. Modified breakfast, lunch and dinner menus are served by Chef MacMillan and his team in elements thanks to Sanctuary's second kitchen facility. Specialty cocktails and elements' menu are also available in Sanctuary's intimate, but hopping bar and lounge, jade bar. Updates on Sanctuary's transformation will be available online at [url]www.SanctuaryAZ.com[/url]. Reservations can be made by calling 1-800-245-2051. Images are available upon request. The "e" in elements and "j" and "b" in jade bar are lower case. Chicago, Illinois, June 24, 2009-The American Hotel & Lodging Association (AH&LA) today announced the winners of the AH&LA Achievement Awards, part of the annual Stars of the Industry Awards, which honor stand-out initiatives at hotel properties. In a ceremony held during the AH&LA Summer Summit at the Hilton Chicago, these awards, which have been awarded annually since 1966, distinguish individual hotels that have developed outstanding programs, events, and campaigns. Winners were chosen for awards in the categories of Good Earthkeeping, guest relations, outstanding community service, special events (one-time event and ongoing), as well as exceptional diversity initiatives. The Orchard Garden Hotel in San Francisco, California, won the Good Earthkeeping award, small property category (150 rooms or more), for making sustainability its guiding philosophy from the day of its ground-breaking. As the first hotel in the state of California to earn LEED certification, its developers even selected the site location based on its proximity to public transportation and used building materials extracted or manufactured locally to build 77 percent of the hotel. Guest rooms feature recycled products, energy management, and recycling programs that function with or without active guest participation, and the whole property saves energy costs by making use of natural daylight in 82% of its occupied spaces. The hotel is constantly looking to improve upon their already succinct eco-friendly processes and engage their guests in sustainability measures, doing so based on environmental and in-depth consumer research. Sheraton Seattle Hotel in Seattle, Washington, is the winner of the Good Earthkeeping award in the large property category (less than 150 rooms). The Sheraton's green strategy focused on three major areas: building infrastructure and physical enhancements; associate awareness and involvement; and guest participation. Several successful green initiatives include giving guests the option to opt out of housekeeping service in exchange for a $5 gift certificate or 500 Starwood points; creation of a "compost only" associate cafeteria where all food waste and debris from meals is 100 percent compostable; use of green cleaning products in guest rooms and meeting rooms; and a 25 percent public transportation subsidy for associates. Energy and water conservation measures have saved more than 4,800 Kwh of electricity annually, and through these and other initiatives, the Sheraton was able to reduce their energy index by 21 percent in the program's first year and recycle approximately 12 tons of materials each month. Sleeping Lady Mountain Retreat in Leavenworth, Washington, won the award for Outstanding Community Service, small property category. The hotel, which won last year's AH&LA Good Earthkeeping Award for a small property, has adopted a philosophy of encouraging its employees to be active in the community and donating to needy organizations. In addition to implementing an annual employee food drive, the property also hosts a variety of events including a Special Olympics cross country ski event; the "Chicks on Sticks" event, which raises money for breast cancer research; and a recycled art show that earns funds for a local recycling group's initiatives. Doubletree Hotel Tulsa at Warren Place in Tulsa, Oklahoma, earned the Outstanding Community Service award for a large property. The hotel's employees, known as the CARE Committee, made a dedicated effort to help those in need all over Tulsa in 2008 via donations to local food banks, participation in the local American Heart Association Walk, time spent beautifying the campus of their adopted school and educating students about sustainability, and assisting their long term non-profit partner, the Hospitality House of Tulsa, which provides home-like lodging and support services for families of patients in Tulsa for medical care. The Doubletree's hospitality extends overseas as well. After donating a stay to a soldier in town on unexpected leave from Iraq, the employees wanted to spread the goodwill to those in his unit who weren't able to take the leave. They sent 10 dozen of their famous Doubletree cookies to his grateful company. The West Inn & Suites in Carlsbad, California, the winner of the Guest Relations award, small property category, opened in May 2006, and has already been ranked the area's #1 property in terms of guest reviews for the past two years. West Inn & Suites has gone above and beyond to offer unique amenities for their diverse guests: free shuttles around town, complimentary Wi-Fi, celebration amenities, specialty packages, free milk and cookies, and even automated bed-time stories for their younger guests. Courteous and timely responses to guest questions - sometimes before they are even asked - also contribute to the flood of thank you notes and positive guest comments and reviews the property has received. Sheraton Atlanta Hotel in Atlanta, Georgia, is the winner of the Guest Relations, large property, honor, because of its new convenient guest feedback system, as well as the high scores it's been recording. This property is among the first in the nation to benefit from real time text and audio reporting of guests' spoken feedback, allowing knowledge and resolution of customer issues before they leave the property. The guest feedback system has been found to help raise satisfaction scores, reduce recovery costs and heighten employee morale. The result gives managers unique opportunities to reward consistently outstanding employees, as well as discover, prioritize and resolve key trends in service delivery. The unbiased guest perspective provides a powerful tool for employee behavior "course corrections" and the ability to segment and track comments on the Internet. Sanctuary Camelback Mountain Resort & Spa in Paradise Valley, Arizona, is the winner of the Special Events, ongoing, small property award. Seven years ago, the Sanctuary decided to get creative to keep guests and locals coming through their doors during the hot summer months, and heighten awareness of their high-end culinary expertise. The Saturday Lunch & Learn program was born, with cooking demonstrations and wine and cocktail pairings adding a dash of education to a delicious three-course lunch. Executive Chef Beau MacMillan leads the sessions, which also draw in notable culinary "guest stars," including accomplished chefs such as Ming Tsai and Andrew Knowlton from Bon Appetit magazine. Kicking off seven years ago in a first session that had about 30 attendees, Lunch & Learn now averages between 60 and 100 participants each week of both locals and out-of-town guests. Not only has this program gained rave reviews and favorable press, it's also garnered estimated revenues of about $30,000 to the property during its slowest season. The Ritz-Carlton Lodge, Reynolds Plantation in Greensboro, Georgia, won the Special Events, ongoing award, large property category, for their annual Lighting of the Lodge event. This is the property's annual benefit for the Greensboro Dreamers, an organization that empowers children in low-income communities to achieve higher education. It's also a huge celebration of the holiday season for the property's guests and local community residents. A live nativity scene, petting zoo, the "largest gingerbread in the south," live music, and 1.5 million white lights set the stage for visitors. The icing on the cake each year is Santa's surprise arrival - which has been by hot air balloon, hang-glider, and on the back of a Marine Corps 7-ton truck. He joined more than 2,500 visitors last year, who in turn year raised $38,000 for Greensboro Dreamers and other local charities. This annual event has become one of the most well-known and well-attended events in the region. The Red Lion Inn, in Stockbridge, Massachusetts, earned the Special Events, one-time only, award for small properties. The Red Lion Inn has gotten creative with a little bit of history, bringing Christmas to life during their "Stockbridge Main Street at Christmas," inspired by the famous Normal Rockwell painting. More than 100 wreaths adorn each guestroom door, harpists play "Silent Night" in the main lobby next to a blazing fire, and even a giant candy castle in the main dining room reminds guests of sugar plums. This celebration also extends beyond the hotel doors, engaging local businesses with tours of the Inn and the area's other historic homes and B&Bs. A holiday street festival takes place outside the property's doors, making this the Berkshire's unofficial holiday kick off event. Before the inception of this event, hotel occupancies during this time were relatively slow. Now the event draws in guests putting the property at 100 percent occupancy, and stimulating local businesses. The Gaylord Opryland Resort and Convention Center in Nashville, Tennessee, is this year's winner in the Special Events, one-time only, large property category. The Gaylord Opryland's Christmas spirit earned them this honor for ICE! Featuring how the Grinch Stole Christmas. To help celebrate the famous book's 50th birthday, the Gaylord hired a team of world-renowned artists to chisel away at several million pounds of ice. The result was a one-of-a-kind, interactive ice sculpture featuring all the favorite characters in Who-ville, on display for almost two months. The popular attraction boosted group sales to the highest they'd been in six years, and increased sales at the retail store next to the attraction by 29 percent, not including the 30,000 cups of gourmet hot chocolate visitors purchased. The event created a major media buzz nationally, especially when Dr. Suess' widow toured the exhibit. Even those who may not have attended the celebration reaped the benefits - the Gaylord used this event as an occasion to donate Grinch books to local libraries and adopt a dog from a local animal shelter to be the Grinch's best friend Max in press events. The Mandarin Oriental Washington, D.C. is the winner of the Prism award for diversity. This property creates a workplace where employees are able to break down the socioeconomic barriers in their personal lives. In 2008, the hotel took the initiative to create a truly motivated and synergized workforce through a community center concept called the Colleague Resource Center (CRC). This center takes into account how an employee's personal life and external influences impact team unity and, in turn, the guest experience. The new CRC provides a convenient location where employees can obtain life skills they may not have access to on their own, such as Weight Watchers, yoga, fitness, budgeting, computer classes, credit awareness courses, and language software programs. As a result, the hotel has seen gender, racial, and religious differences melt away and employees begin to relate to one another in new ways and find new common ground. Many of AH&LA's partner state associations choose their own property award winners, which are submitted to the association for national judging. Making the decisions in this year's competition were Bob Craycraft, vice president of industry relations for the American Resort Development Association; Phil Hayward, chief communications officer for the National Recreation & Parks Association; and Pat Maher, owner of The Maher Group, LLC, and AH&LA's green consultant. The awards ceremony was sponsored by U.S. Foodservice. For more information on AH&LA's Stars of the Industry Awards program and a full list of this year's property and employee winners, please visit www.ahla.com/stars. To contact any of the winning properties, contact Jessica Soklow, AH&LA manager of media relations, at (202) 289-3153 or jsoklow@ahla.com. Serving the hospitality industry for nearly a century, AH&LA is the sole national association representing all sectors and stakeholders in the lodging industry, including individual hotel property members, hotel companies, student and faculty members, and industry suppliers. Headquartered in Washington, D.C., AH&LA provides members with national advocacy on Capitol Hill, public relations and image management, education, research and information, and other value-added services to provide bottom line savings and ensure a positive business climate for the lodging industry. Partner state associations provide local representation and additional cost-saving benefits to members. Scottsdale, AZ. (February 9, 2009) - In a year where travelers will look for the biggest bang for their buck, they should also consider resorts they can enjoy without paying a la carte for amenities. One of the country's most lauded destinations, Sanctuary on Camelback Mountain in Scottsdale, Arizona gives you myriad ways to enjoy its environs and facilities without reaching for your wallet. For nature lovers, there's the opportunity to visit the resort's new Hummingbird Sanctuary where specially-designed feeders attract as many as 400 species of hummingbirds. Guests can also take a Botanical Walk led by Sanctuary's Landscape Manager/Designer to learn about the native flora and fauna (30 species) that makes such a bold and beautiful statement at the property. At Sanctuary, it's easy to keep fit - and free. Guests can attend complimentary fitness classes, which include pilates and yoga. They can also participate in daily, 7 a.m. stretch and meditation classes in the meditation courtyard of Sanctuary Spa. It should be noted that spa-goers get the benefit of the full 60 minutes of a one-hour treatment, not the standard 50 minutes typical of other spas. Other complimentary activities for guests include a Friday Art Walk to visit and learn about the many sculptures and paintings on the grounds of Sanctuary, collected by the international Calvin Charles Gallery, located in Scottsdale. The Art Walks are conducted by one of the gallery's representatives. On Saturdays, jade bar is action central at 3 p.m. as Sanctuary's mixologist shares his tricks of the trade and guests, for just $20, get to sample the outcome as well as go home with the recipe for each drink. To ensure that guests take their memories home with them, Sanctuary provides complimentary use of a digital camera during a guest's stay. Their photos can be printed or emailed to them via Sanctuary's business center. Guests also have the option of purchasing a memory card that they can take with them. Additional advantages to staying at Sanctuary on Camelback Mountain include its 100 percent pet-friendly policy, requiring no deposits or nightly fees. What's more, pets get a gift upon arrival, along with gourmet treats and toys with the resort's compliments. Two-legged guests who book one of Sanctuary's Mountainside Estates (spectacular private homes) through June will find a complimentary Jaguar sedan or coupe at their disposal for their trips around the area. For more information or to make a reservation, visit www.SanctuaryAZ.com or call 1-800-245-2051. Images are available upon request. Scottsdale, AZ. (September 8, 2008) - Sanctuary on Camelback Mountain, Scottsdale, Arizona's nationally-lauded boutique resort and spa, is pleased to announce a partnership with Flight Options, one of the country's leading private jet aviation companies. Now, guests of the Mountainside Estates at Sanctuary - a collection of private mountain homes - enjoy unique access to Flight Options' fleet of 120 aircraft, with no minimum leasing terms or program fees. Flight Options' clients also enjoy preferred access to Sanctuary, including special rates, concierge services, complimentary experiences and Sanctuary's stylish Spa Casitas surrounding the resort's infinity-edge pool as well as Sanctuary Spa. Ultimately, the symbiotic partnership will offer travelers an elevated experience from start to finish. "We're happy to partner with Flight Options - their reputation for safety and luxurious service made them an easy choice," said Mike Surguine, vice president and general manager of Sanctuary on Camelback Mountain. "Private air travel is becoming increasingly important to our guests, and this program gives them a flexible, no-strings-attached opportunity to use Flight Options' services." Kenn Ricci, founder and chairman of Flight Options, added, "Many of our clients are looking for a unique destination during their travels, which made the Mountainside Estates at Sanctuary a natural fit. Our customers want the best, and we know Sanctuary will more than meet their expectations." The Mountainside Estates at Sanctuary are a true private haven - each of the distinctive homes is an architectural masterpiece. Ranging up to 5,500 sq. ft. and situated on one acre of land, guests are cosseted from the outside world, enjoying the ultimate retreat of a private home with full access to Sanctuary's resort amenities and services. From the foothills of Camelback Mountain to the skies above, guests travel in style with Flight Options. Its fleet includes light, mid-size, super mid-size and large cabin aircraft such as the 7-passenger Hawker 400 XP, 8-passenger Hawker 850XP, 8-passenger Citation X, and the 13-passenger Embraer Legacy Executive. The Flight Options and Sanctuary teams are available to arrange every aspect of the unmatched travel experience, from scheduling flights to arranging ground transportation, catering and special activities, such as Sanctuary's Mi Casa, Mi Chef personalized dining program. For more information or to make a reservation, please call 480-607-2300 or visit www.sanctuaryaz.com. access to elite amenities including luxury vehicles for exploring the area during their stay, as well as private jet transportation through Sanctuary's partnership with leading private jet company, Flight Options. Whether indulging in a two-night stay or month-long getaway, guests of Sanctuary's Mountainside Estates enjoy all of the resort's concierge and in-room services, with a personal butler and private luxury vehicle available upon request. Through a partnership with Flight Options, Sanctuary's estate guests also have access to a fleet of 120 aircraft, with no minimum leasing. Sanctuary on Camelback Mountain (Scottsdale, Ariz.) is pleased to announce the appointment of Robert Vance as spa director at the award-winning Sanctuary Spa. Vance will oversee all areas of operations pertaining to the spa, salon, tennis and recreation facilities. In 2008 the Sanctuary Spa was named the 2008 "Most Excellent Spa Hotel" by Cond Nast Johansens Awards for Excellence and introduced a revitalized menu of spa services. "We are confident that Robert's extensive experience in the hospitality industry, particularly in spa management, will further propel Sanctuary's reputation as an acclaimed spa destination," said Mike Surguine, general manager of Sanctuary on Camelback Mountain. "His proven leadership will be an invaluable asset to our Spa's growth." Prior to joining Sanctuary, Vance spent five years with the Golden Door brand. Most recently, Vance served as the spa director of the Golden Door Spa at Naples Grande Beach Resort in Fla. during its 2007 opening. Earlier, Vance was spa operations manager at the Golden Door Spa at The Boulders Resort in Carefree, Ariz.
Vance graduated from Pepperdine University with a Bachelor of Arts degree. Scottsdale, AZ. (September 8, 2008) " Sanctuary on Camelback Mountain, Scottsdale, Arizona's nationally-lauded boutique resort and spa, is pleased to announce a partnership with Flight Options, one of the country's leading private jet aviation companies. Now, guests of the Mountainside Estates at Sanctuary " a collection of private mountain homes " enjoy unique access to Flight Options' fleet of 120 aircraft, with no minimum leasing terms or program fees. Flight Options' clients also enjoy preferred access to Sanctuary, including special rates, concierge services, complimentary experiences and Sanctuary's stylish Spa Casitas surrounding the resort's infinity-edge pool as well as Sanctuary Spa. Ultimately, the symbiotic partnership will offer travelers an elevated experience from start to finish. "We're happy to partner with Flight Options " their reputation for safety and luxurious service made them an easy choice," said Mike Surguine, vice president and general manager of Sanctuary on Camelback Mountain. "Private air travel is becoming increasingly important to our guests, and this program gives them a flexible, no-strings-attached opportunity to use Flight Options' services." The Mountainside Estates at Sanctuary are a true private haven " each of the distinctive homes is an architectural masterpiece. Ranging up to 5,500 sq. ft. and situated on one acre of land, guests are cosseted from the outside world, enjoying the ultimate retreat of a private home with full access to Sanctuary's resort amenities and services. From the foothills of Camelback Mountain to the skies above, guests travel in style with Flight Options. Its fleet includes light, mid-size, super mid-size and large cabin aircraft such as the 7-passenger Hawker 400 XP, 8-passenger Hawker 850XP, 8-passenger Citation X, and the 13-passenger Embraer Legacy Executive. The Flight Options and Sanctuary teams are available to arrange every aspect of the unmatched travel experience, from scheduling flights to arranging ground transportation, catering and special activities, such as Sanctuary's Mi Casa, Mi Chef personalized dining program. For more information or to make a reservation, please call 480.607.2300.